Bud Abbott and Lou Costello deliver their "usual high quota of laughs" (The Hollywood Reporter) in this hysterically funny slapstick farce that boasts some of their most beloved comedy bits, such as the immortal "Mudder and Fodder" routine! 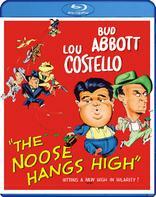 Window washers Ted Higgins and Homer Hinchcliffe (Abbott & Costello) are mistaken for messengers and sent to collect $50,000 by a gangster who runs a gambling syndicate. But Homer inadvertently mails the cash to a woman (Cathy Downs) who spends it before they can track her down. Faced with a thirty-six hour deadline to come up with the gangster's dough, the desperate trio must act quickly...or it'll be their necks! Soundtrack by Walter Schumann (Charles Laughton's The Night of the Hunter, TV's Dragnet).